What's In Your Film Camera Bag, Braedon Flynn? 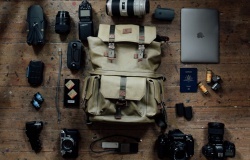 Curious about what professional film photographers keep in their camera bags? In our new blog series, we're asking the pros to unpack all the gear that makes their film photography "click". As you can see, I shoot with and use A LOT of gear. It's sort of silly--but each camera and lens does it's own thing for certain purposes and I hate leaving any of them behind. For starters, I use the ThinkTank Airport Security bag, which fits most everything I need. I try my best to never let anyone from the airline feel how heavy this bag is, which I carry on to all my flights, because it weighs somewhere around 70lbs. For my shoulder/lens bag, I use this one from Kelly Moore--it's an older bag, but this is the closest version of what I use. I love it because very few bags I could find had zipper pockets, which I use for my film. There are two zipper pouches in the front, one for 120 film, the other for 35mm film, and a bigger zipper where I put all my exposed film. I use two different systems to carry my cameras while I'm shooting. I wear the Holdfast Money Maker, and usually I keep my 35mm film bodies on there. The Canon EOS 1V for color and the EOS 1n for black and white film. I like the 1V better and it definitely gets used more, but they're pretty similar cameras. I also wear the Spider Holster system (you can get at a discount over at Film Supply Club if you're a member there). That system is worn around the waist, and I keep my two medium format cameras there. I strap a Think Tank fanny pack to the front of my Spider belt--or, if I'm not wearing that, it attaches to a regular belt easily. In that bag, I keep all the film I need when I need to access it quickly. I use the Spider Holster Spider Money clip to attach my light meter to my belt, as well. It's a super handy little clip. 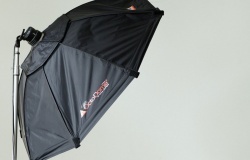 Works for flashes or LED lights as well. My main guns are two Contax 645 cameras. I keep color film in one and black & white in the other. In the cameras that I carry, I keep color film loaded in cameras on the right side of my body, and black & white film loaded on the left side of my body. That way I always know what I'm grabbing for and shooting instead of constantly having to check or accidentally shoot B&W when I meant to be shooting color. I also have a Phase One, IQ250 digital back that attaches to one of my Contax cameras. I use that mainly in lower-light situations where I can shoot up to 3200 ISO in color--it gives me a closer rendition to film than a 35mm digital. The 35mm cameras mainly get used during the ceremony or during motion/walking photos. The medium formats are used for most everything else. Especially portraits and details/decor. I shoot with the Rolleiflex sparingly because I already have a lot going on, but man, I love that look. I almost always keep black & white 400 speed film in there. Either Kodak Tri-X 400 or Ilford Delta 400. I feel like Ilford is a bit prettier, so I typically use it at weddings. With more fashion/editorial-leaning shoots, I go with Kodak. Digital gear usually comes out at the reception. I have the Canon 5D mark IV, which is pretty rad. It's an awesome camera for low light. My favorite 35mm lens is the Canon 50mm 1.2L. My next favorite would be their 85mm 1.2 lens. I don't generally like shooting wide except for specific shots where the room is super tight or if I'm showing a landscape--like during the ceremony. I keep the Canon 70-200 2.8L lens on a lot as well. Then, the 17-40 4.0L will come out at receptions with really crowded dance floors. The 35mm lens is my top choice for reception dance floor photos though. I always use rechargeable batteries for all my cameras that will take them. I travel with 4 AA battery chargers, a couple Canon battery chargers, an LED light, off-camera flash, and light stand. For destination events, I carry on a backpack generally full of film, my laptop, and a couple hard drives to work from and backup photos from shoots. WIN A ONE-YEAR MEMBERSHIP TO FILM SUPPLY CLUB! Enter the giveaway on Richard's Instagram. What's In Your Film Camera Bag, Sandra Coan? What's In Your Film Camera Bag, Jai Long?